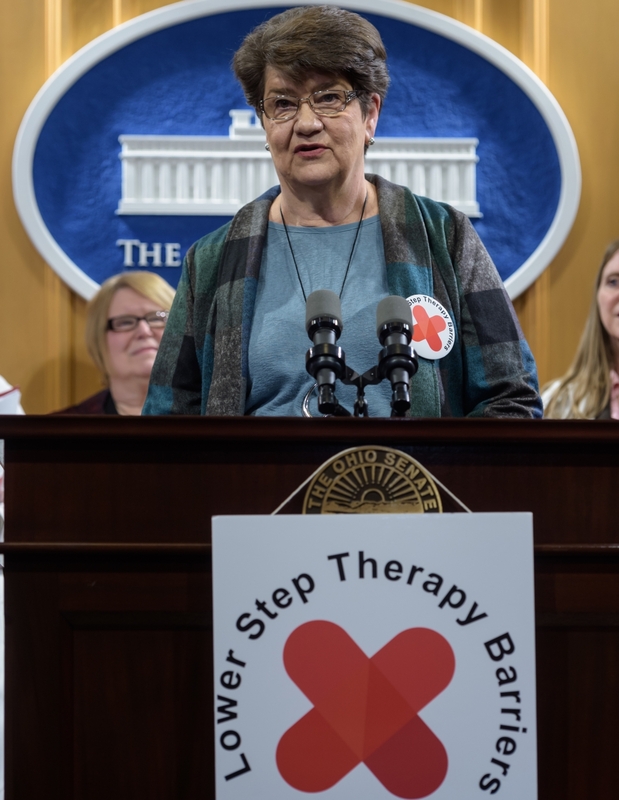 COLUMBUS—State Senators Peggy Lehner (R-Kettering) and Charleta B. Tavares (D-Columbus) today held a press conference with members from the Ohio Step Therapy Coalition to highlight the importance of passing Senate Bill 56, which aims to minimize barriers to treatment by improving the step therapy process also known as "fail first." The press conference was held in conjunction with the Ohio Step Therapy Coalition's annual advocacy day, also held at the Ohio Statehouse. "This legislation has been an important topic of conversation for a number of years and, as lawmakers, we should not delay its passage any longer," said Lehner. "The bill aims to balance cost containment for insurers with the ability of physicians to make decisions, and it is clear that striking the right balance is in the best interests of Ohio's patients." Senate Bill 56 seeks to improve—not do away with—the step therapy process by requiring that an insurer’s process for requesting a step therapy override is transparent and made known to the provider and patient and would allow automatic exemptions to step therapy requirements under certain circumstances. "Doctors, not insurers, should be making the decision as to which treatment their patients need," said Holly Pendell, Director of Advocacy and Activists Engagement, National MS Society. "Over the past three years that this issue has been before Ohio lawmakers, patient advocates have offered substantial evidence that reform is needed." 1. When the medication required by the insurer causes an adverse reaction to the patient, such as an allergy. 2. The patient has tried and failed the required medication, or a drug in the same class, under their current or previous health insurance plan. 3. The required prescription is not in the best interest of the patient. 4. The patient has been stabilized on a prescription selected by their physician regardless of whether that patient was on their current or previous health care plan at the time of stabilization. However, a health benefit plan may require a stable patient to try an AB-rated generic equivalent prior to providing coverage for the branded drug. "Senate Bill 56 prioritizes the needs of patients to get the medication prescribed by their physician when it is in their best health interest. The bill will enable patients to get the right medication to treat their condition and improve health outcomes while balancing cost containment measures to reduce medication expenditures," stated Senator Charleta B. Tavares.